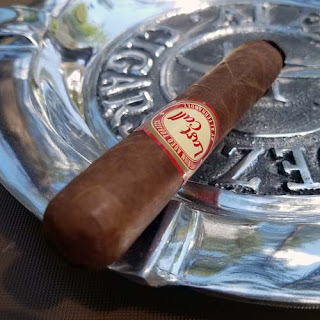 The KAIROS cigar is a micro batch project blended by the Ezra Zion Cigar Company for Blessed Leaf, a cigar based Christian ministry, to support their mission and share their message. Total production of the KAIROS has been limited to 4000 cigars; 100, 20 count boxes and 400 five packs. The KAIROS is offered in one vitola only, a box-pressed 6.25 x 52. Removing the KAIROS from the cellophane I see a high quality, hand made cigar with attractive dual bands. The quality Corojo 99 Rosado wrapper is rolled on with near seamless care and it contains only very fine veins. Feeling down the body I found it firmly packed from head to foot with not hard or soft spots. Testing aromas, from the foot I found notes of molasses and rich tobacco while the free cold draw contained hints of spicy cedar. 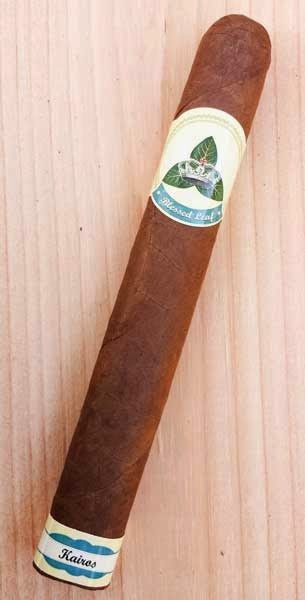 Once the cigar was toasted and burning it produced a large volume of mild bodied smoke with an oak, brown sugar flavor mix that left behind a lingering sweetness. Testing the flavors with a quick retro hale I could sense nuts and cream. As the burn progressed it left behind a soft light gray ash and flavors of hay, sweet cream, caramel and nuts joined the mix. By the final third the strength had moved more into the medium range while flavors of coffee and leather dominated the mix. The KAIROS finished with a flavor mix of coffee, mild leather and rich tobacco. Overall, I found the KAIROS to be a high quality mild/medium bodied cigar with top notch construction and a good flavor mix that was a joy to smoke. I would like to thank the Ezra Zion Cigar Company giving me the opportunity to review this cigar!